Part Three of Three: The Art Bears Songbook in Victoriaville, May 2008 and in Carmaux, Sept. 2010. When I heard that the Art Bears Songbook would close the 25th edition of the FIMAV festival in May 2008, I immediately phoned Victoriaville to secure a ticket and booked a flight for Quebec. After all, it had been more than 25 years since the Art Bears called it a day. The very idea was audacious. The bar had been set so high by the albums! How could the performance do anything but disappoint? Hopes ran as high as the expectations. Much work had been done in rehearsal time leading up to the performance, which took place, I believe, in a closed-down wing of the Colibri Hotel. I suspect that the job of writing the material into concert-ready form fell largely on the shoulders of Fred Frith, although I equally suspect that the final form of things was crunched out by the group on the rehearsal room floor. I saw Frith and Cutler, and Dave Kerman too, sitting in the lobby of the Colibri Hotel, sheet music spilling over a table, ironing out last details. A friend and I took the opportunity to drop off a few bottles of wine to the table, for the band, as a (silly?) kind of thank you gift for everything that had come before. But, as is well known now, the band delivered a performance for the ages at FIMAV, one that rose even higher than the high hopes and expectations of those in attendance. For me, it was not only the highlight of the festival, but my own favourite concert ever! I was so enthralled that afterwards I said I’d travel anywhere to see it all again. Hence, in September 2010, I found myself in Carmaux, France, at the Rock in Opposition festival, where the Art Bears Songbook would take the stage for a second time. The performance in Quebec had the cachet of being the first, but the show in Carmaux would have something the FIMAV show didn’t – Dagmar Krause would join the band in France! In Victoriaville, Jewlia Eisenberg, Kristin Slipp and Carla Kihlstedt did a very fine job handling the vocals. They didn’t attempt to emulate the stylings and delivery of Krauss, but rather played to their own considerable strengths to set the songs. Eisenberg was ill and could not participate in Carmaux, which set the stage for Krauss to join the group. And she was in fine form. The singing that left you breathless when listening to the albums left you breathless live as well. There were some technical difficulties to be overcome in the beginning stages of the show; the vocalists seemed to be having some trouble with getting the right balance in their monitors and may have had trouble hearing themselves, but this was not an issue out front in the audience. We were too busy being awe-struck at how the band pulled off performing parts of songs that were originally studio constructions. The instrumental sections of Rats and Monkeys, for example, were jaw-dropping. If you weren’t at either concert, go listen to this piece (from Winter Songs) and imagine that being rendered live. Or, what do you do with something like the backwards / manipulated vocals that begin First Things First? (from Winter Songs) You could bypass them altogether and do something different, or just play a tape alongside the band, as some groups would, or if you’re Dagmar Krauss and Kristin Slipp, you learn to sing the backwards / manipulated vocals in real time! And that drumming? If you thought that Chris Cutler’s drum kit sound could only exist in a studio, you were wrong. The sound, the tension, the breath and space, the rhythms, the colours – it was all there in real time, right before our ears. Zeena Parkins and Carla Kihlstedt are essential too. I can’t imagine the band without them. Both (as well as the Norman Conquest) are members of Frith’s Cosa Brava, and the time, energy, and fun, that they’ve poured into playing together is clearly audible. (Parkins, of course, also played with Frith in Skeleton Crew and with Cutler in News From Babel, as well as many other groupings, improvised or otherwise, over the years). And what more can be said of Fred Frith? He continues to be where he has been for close to 40 years now – at the forefront of cutting new music. He bounced from electric guitars to bass to piano and also provided some vocals, and at the end of the night he probably breathed a great sigh of relief and, I hope, a great smile too. I certainly did. This was the best concert I’ve seen since the last time I saw the band in Victoriaville. It’s not so often you see a show end with the audience standing, clapping, hollering and then booing the stage crew when they start dismantling the stage. This crowd wanted more, and I hope they get it. 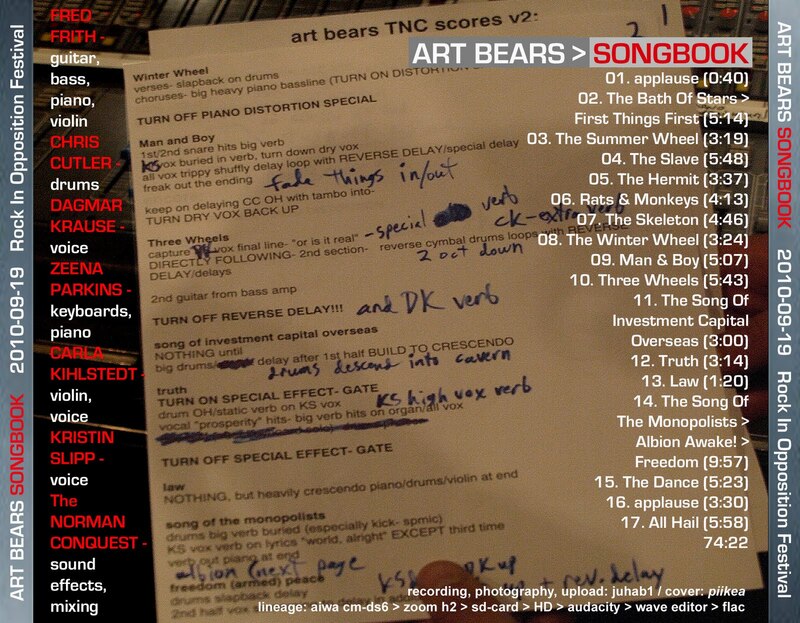 The Art Bears Songbook is a wild, artistic success and I hope their day is not yet done. These two very cool images from the Carmaux concert were taken from a blog called The Clock That Went Backwards. Once upon a time, in the 1970s, there was a seminal and superb band called Henry Cow. Fred Frith and Chris Cutler were members of that illustrious band. In early 1978, they set upon the task of writing some new material for the next Henry Cow album. What they wrote were songs, which were recorded by Henry Cow, but subsequently considered to be unsuitable for the band. 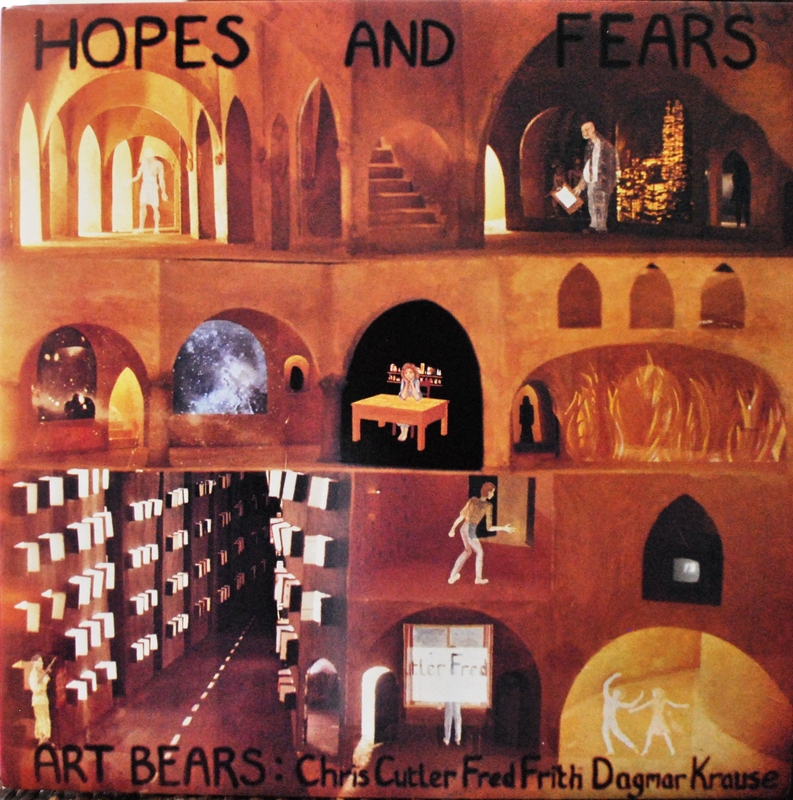 So, Frith and Cutler – and Henry Cow’s inimitable vocalist, Dagmar Krauss – took the songs and worked the material into an album that would be released under the banner of the Art Bears. So, in a sense the Art Bears came into existence as an organic outgrowth of Henry Cow. In fact, the other members of Henry Cow, Lindsay Cooper, Tim Hodgkinson and Georgie Born, can all be heard on the first Art Bears album, titled Hopes and Fears (1978). 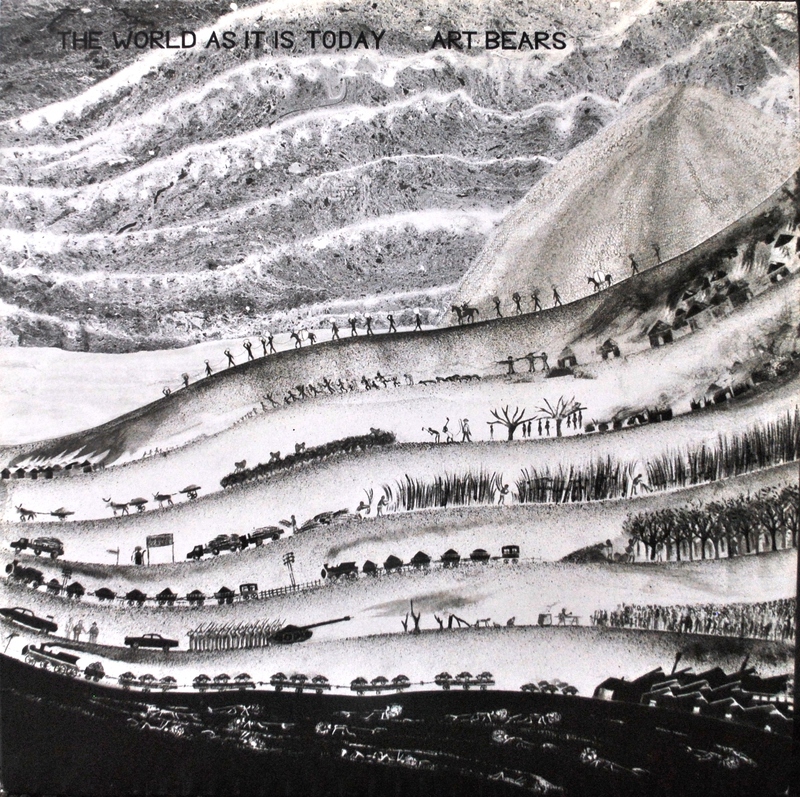 Two more albums followed before the Art Bears called it a day: Winter Songs (1979) and The World As it is Today (1981). There was a short tour of Europe in the spring of 1979, with Marc Hollander (Aksak Maboul) and Peter Blegvad (Slapp Happy/Henry Cow) along as guests. Their three albums still stand as high water marks of so-named avant rock / RIO / progressive music. Let’s put aside these labels and just call these albums three of the most compelling, unflinching and breathtaking recordings yet to be released by homo sapiens sapiens! Make An effort to seek out these recordings if you are not familiar with them! Then, almost as fast as they had come, they were gone. They called it a day in 1981, but in short order, the Art Bears acquired legendary status in their field. Fast forward more than two decades and a young and frighteningly formidable violinist by the name of Carla Kihlstedt and vocalist extraordinaire Jewlia Eisenberg were playing in a band that included Art Bears songs in their repertoire. They asked Fred Frith to join them, which he did, once. The results prompted Eisenberg to invite both Frith and Chris Cutler to participate at a later gig. The intent was there, but the gig never happened. Still, the seeds for the Art Bears Songbook were sown here. 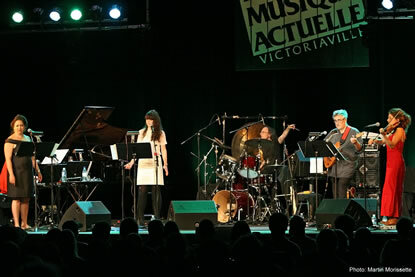 A few years later, the idea re-emerged and then the 25th edition of the Festival International de Musique Actuelle de Victoriaville provided an opportunity. But the FIMAV performance was not intended to be Rock in Opposition’s version of an Eagles Reunion. This was to be a contemporary revisiting of the Art Bears’ work, an approach to the material that would move forward as it looked back. To this end, an enhanced and expanded line-up would take to the stage in Victoriaville. Nobody likes the phrase ‘supergroup ,‘ but let’s face it – Zeena Parkins (keyboards, accordion), Carla Kihlstedt (violin, vocals), Jewlia Eisenberg (vocals), Kristin Slipp (vocals) and the Norman Conquest (sound manipulation), in addition to originals Fred Frith (guitar, bass, piano) and Chris Cutler (drums). The Art Bears’ original siren / singer, Dagmar Krauss, did not participate at FIMAV. Next time: The Art Bears Songbook in Victoriaville, May 2008 and in Carmaux, Sept. 2010.